How do I upload a Recurring CSV Batch file in the Virtual terminal? Importing a Recurring CSV file in the VT can happen in a few steps process. Go to Import, then Credit Card Recurring. Choose a Transaction Group and a Transaction Schedule. Click the Browse button, where you will choose a file to upload. Lastly, click the Upload File button. 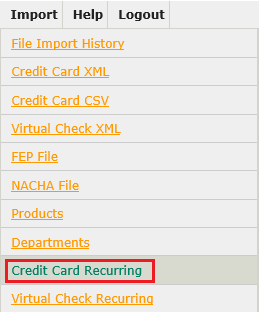 Your file will be validated against the Credit Card Recurring CSV File Specifications and processed at the next processing interval. Note: There are a set of specifications to meet in order for the file to pass validation. Click the link below to view the required specifications. What is the Anonymous Donor feature in Donate Now?